To provide support to truck drivers and their families experiencing financial difficulty due to being out of work for an illness or injury. We help cover household expenses during these times. We also offer free vaccines for flu, shingles and pneumonia, as well as a smoking cessation program for semi-truck drivers..
Studies have shown that more than 70% of the 3.5 million professional truck drivers in the U.S. have one or more serious health problems such as obesity, diabetes, sleep disorders and cardiovascular disease. Truck drivers also lack the same access to health that most Americans enjoy. Access is limited because drivers work irregular hours, spend long-durations away from home, and are unable to navigate side streets and parking lots in their trucks to get to a clinic, pharmacy or hospital. Compounding the problem is the fact that more than one-third of truck drivers do not have health insurance. The unfortunate result of these circumstances is that drivers are often unable to get treatment in the early stages of disease, allowing the condition to progress to a much more severe state. Minor illnesses become severe, leading to hospitalization and disability. The driver then may lose his/her commercial drivers license and become unable to work. This creates a downward spiral that leads to extreme financial hardship. To help with this hardship, the St. Christopher Fund offers assistance. Assistance may be in the form of direct payment for medical services or prescription drugs, assistance with expenses while recovering from illness and out of work, or negotiating price reductions with medical providers and hospitals. 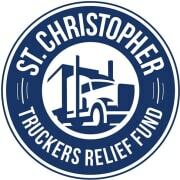 Would you recommend St. Christopher Truckers Fund?